"North Texans for 9/11 Truth" would like to encourage individuals and groups to place classified ads and to utilize other promotional vehicles. Anyone can do this. (ALERT) Head to the 9-11 museum this Wed. to speak out against this event: 9/11 Conspiracy Theories: Why They Exist and What Role They Play in Society. Here's the place to be on Wed. for all you "conspiracy theorists". Head to the 9-11 museum this Wed. for an event entitled: 9/11 Conspiracy Theories: Why They Exist and What Role They Play in Society. This is an informal, pre-announcement to assist in preparation of an all day, July 11th event. 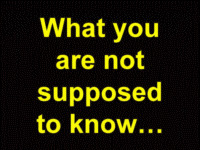 The film and speaker symposium is entitled: "WHAT YOU ARE NOT SUPPOSED TO KNOW ABOUT 9/11: Building 7 – Gone in 7". 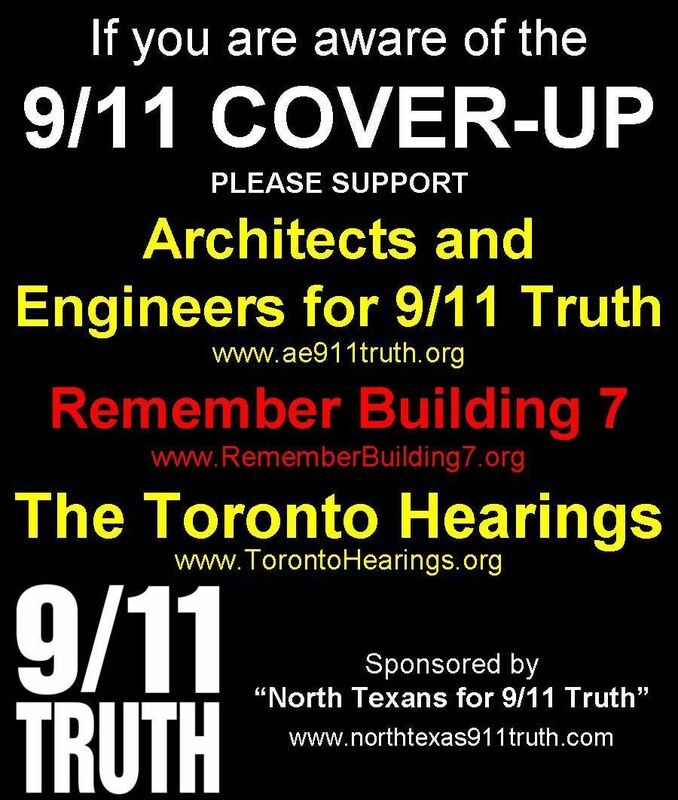 The North Texans for 9/11 Truth Group is in the process of organizing the Program for this landmark event. As part of the planning, we wanted to broadcast an invitation for possible presentation speakers (such as scientists, researchers, architects, etc.) who would like to be featured during this all day information fair. Our group is working with a pauper's budget, but there might be some alternative financial options which could prove viable for potential speakers. Please contact Dallas911Truth@aol.com if you have an interest in speaking or helping with the event. Critical Perspectives on 9/11 and Canada's "War on Terror"
Professor MICHAEL KEEFER (CANADA), Professor of English, University of Guelph, Graduate Royal Military College of Canada, Former President, Association of Canadian College and University Teachers of English. Widely published on "War on Terror", "Toronto 18", 9/11, and philosophy. 9/11 First Responder Benefit in Santa Cruz this Thursday! In solidarity with the 9/11 First Responder benefit in New York City, we are having a 9/11 First Responder benefit in Santa Cruz, CA, on September 18th with a film screening of Truth Rising. * Follows the growing momentum of the 9/11 Truth Movement. * Exposes the mistreatment of our 9/11 heroes. * Shows the growing number of people questioning the official version of events that day. * Features interviews with Willie Nelson, Rosie O'Donnell, Jesse Ventura, George Carlin, Martin Sheen. * Features confrontations with many political figures including Bill Clinton, David Rockefeller, and Arnold Schwarzenegger. For more than five years since September 11, 2001, William Rodriguez has been relentless in his crusade to help September 11 victims and their families, and in bringing to audiences in Europe, Asia, South America and the U.S. his explosive testimony challenging the official account of the freefall collapse of New York's Twin Towers and Solomon Building. The Puerto Rican-born, New Jersey resident was a custodian at the World Trade Center for nearly twenty years and was in-charge of the three stairwells — A, B and C — in the North Tower. In possession of the master key that opened all of the stairwell doors on each floor of the 110 story building, William Rodriquez personally saved the lives of 15 people that day and aided New York City firefighters in saving hundreds of others. Let's get the creativity juices flowing and throw out ideas for taking advantage of the holidays and observances in May. We can co-opt these and use them for 9/11 activism events. Here are the days available. Mention others if they are not listed here. This was sent into me by Kathy from annarbor911truth.com. On April 7 annarbor911truth.com hosted Kevin Ryan, Kevin Barret and William Rodriguez for an unforgettable afternoon of truth in the League ballroom. We filled over three hundred chairs for this event called "TRUTH STRIKES BACK". Originally, the group had planned to sponsor a debate. We invited the members of YAF, a popular rightwing organization on campus to to debate us on the following issue: "Have the government and media lied to the public about the events of Sept 11." Though we issued several polite invitations these were declined. Next we tried the physics department at the University of Michigan as well as three departments in the school of engineering, Civil, Materials Science and Mechanical. We sent each faculty member a personal invitation as well as a copy of "Improbable Collapse" All of the invitations were declined or not answered; that's over three hundred invitations total for the University faculty. No one would defend the official story as related in the NIST, FEMA and 9-11 Commission Report. 911 Mysteries: Demolitions.... University of Arizona Website FRONTPAGE!! the event on the front page of the University web page. "911 Mysteries: Part 1 -- Demolitions"
This important, detailed documentary presents clear scientific analysis of the fall of the buildings at the World Trade Center and contrasts that with the official story we have been given about Sept. 11, 2001. All events are subject to change/cancellation without notification. September 11, 2001 was a catastrophic day in our country’s history. Three thousand people lost their lives in this tragic attack. As horrible as this loss has been it has, according to some, initiated an even greater loss to the nation: our civil rights. These speakers allege that, using 9/11 as a weapon, our current administration has terrified us into letting the NSA spy on our phone conversations, giving up our rights to habeas corpus and - mostly recently - allowing the government to open and read our conventional mail without a warrant. Anyone who dares object is "on the side of the terrorists". Panel discussion by three members of Scholars for 9/11 Truth about the effect that 9/11 has had on our civil rights. Q&A session will follow. Dr. Kevin Barrett is an associate lecturer in Islamic and Arabic Studies at the University of Wisconsin-Madison. When it became known that he planned to speak openly in class about 9/11, state officials nearly had him fired. Kevin Ryan is a former site manager for Environmental Health Laboratories (a division of Underwriters Laboratories, Inc.). He was fired by UL for writing a letter to the National Institute for Standards and Technology (NIST), which questioned the draft WTC report NIST generated in October 2004. Thanks Adam for the heads up! Our next meeting will be on Wednesday, January 10th, 7 p.m., at the National Press Club. The speaker for this session will be James H. Fetzer, who has published over twenty books and is the founder of Scholars for 9/11 Truth (www.911Scholars.org). Since we have heard a variety of credible and incredible stories describing this day of tragedy, Fetzer will be presenting us with the hard facts on the truth of the following scenarios: (1) that the Twin Towers were pulverized by a special form of controlled demolition; (2) that WTC-7 was brought down by a classic form of controlled demolition; and (3) that whatever hit the Pentagon, it was not a Boeing 757. In addition to his books, Fetzer has written over a hundred articles on the philosophy of science and the theoretical foundations of computer science, artificial intelligence, and cognitive science. No stranger to controversy, this former Marine Corps officer has edited three books on the death of JFK, and has co-authored a book on the airplane crash that killed Senator Paul Wellstone. Our speaker will be coming to us from Athens, Greece, where he was featured on a three-hour fact finding international satellite television broadcast. So plan to be with us... and please remember to bring a friend. N.B. National Press Club members may attend free of charge, but they must pay for their meals. Parking is free with NPC dinner validation of your ticket from the PMI garage on G St, between 13th & 14th. Thanks Thomas for the heads up! Yesterday was the fourth and last day of the 4-day 9/11 event I organized together with a friend who has lots of experience with organizing many different kinds of events. I am overall satisfied with how things went, although I had hoped it would have been much better. 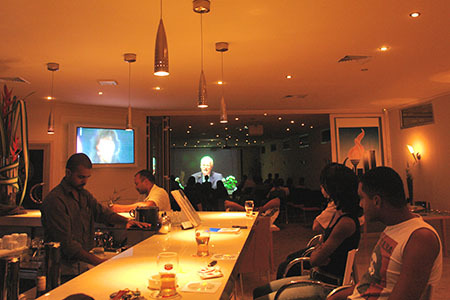 The event lasted from November 24th till November 27th, each day from 6pm to 10pm.